The Roll Call Attendance feature in Canvas allows instructors to indicate who was present, absent, and tardy for each class session. Students can be viewed in a list or arranged in a seating chart. As soon as an instructor takes attendance using the Roll Call feature, Canvas creates a column in Grades showing a %, which it updates each time attendance is taken. Use the seating chart early in the semester to make it easier to get to know students. In large classes where students are less visible as individuals and TA support might be available, use Attendance to reinforce expectations and policies. Reports from Attendance produce a spreadsheet that shows the whole class list for each session, rather than a single list with a column for each session, making it difficult to use for overview and calculations. Use of reports is not recommended at this time. There is no straightforward way to indicate when an absence is excused. Below the links to Further Information, see some suggestions for addressing this concern. 1. Mark the student present in Roll Call, then click more. 2. Click on Add badge. A badge functions like a marker to indicate something about the student’s participation in the course that day. 4. Click on the Excused Absence badge. The badge will change to the color you chose when you created it. This can serve as a record that the student’s absence was excused, and the student will receive the same grade as if they were present in class. Mark the student as absent in Attendance. Change the student’s grade in Grades to a dash (no grade given) or full credit. 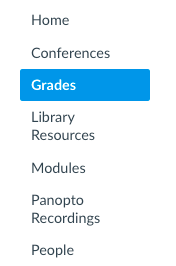 Click on Grades in the navigation menu. 2. Adjust the grade of the student. If attendance is out of 100 points, it could be changed from 0 to 100.